If you build a perfect sandcastle, a dragon will move in. And that’s exactly what happens to one very lucky boy at the beach. Dad is busy sunbathing and Mom is busy with her book, so the boy and dragon roam the beach together, flying a kite, braving the waves, and roasting marshmallows. But no one believes him when he shares the news of his magnificent dragon: Mom only hears the roar of the ocean, Dad thinks the dragon feather is a seagull feather, and know-it-all sis claims there’s no such thing as a dragon. That’s when the sandwiches mysteriously disappear, claw prints are found in the brownies, and dragon-giggles erupt from the strangest of places. Heh-heh-heh. Is there truly a mischievous dragon running around on the beach or is someone’s imagination running wild? Decide for yourself When a Dragon Moves In. Hilarious Read about a Fire-Breathing Troublemaker! Uproariously silly cause-and-effect story shows the joys and eventual problems of having a dragon for a best friend. When a dragon moves into this boy’s sand castle, he’s absolutely thrilled. After all, this scaly fire-breather frightens away bullies and makes it easy to toast marshmallows. But then the dragon starts messing up the brownies and flicking sand at the other kids…and guess who gets in trouble? Told in the circular style of If You Give a Mouse a Cookie, this funny book reaches its conclusion, and invites a return to the beginning for the whole hilarious story to begin again! 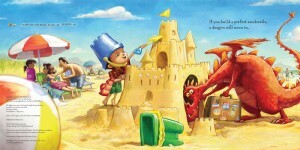 Fans of If You Give a Mouse a Cookie and its sequels should enjoy how debut author Moore, channeling an imaginative boy at the beach with his family, muses upon the consequences of having a bright red dragon take up lodging in his sand castle. At first it’s all fun and games (“…you’ll have a built-in marshmallow toaster”), with a little subterfuge thrown in (since there’s no smoking on the beach, “you’ll have to hide his smoke from the lifeguard”). But as the day wears on, the fantasy begins to impinge on others. Ultimately, the cardinal sin of the beach is committed: throwing sand at one’s annoying big sister. “Then you’ll march over to your sandcastle and order your dragon to leave until he learns some manners,” says the narrator, who seems firm in his resolution, but who will live to pretend another day. Although it’s not the freshest concept on the shelves, Moore has a light, sure touch, and she gives McWilliam (I Need My Monster) plenty of room to exercise his considerable gifts for operatic expressiveness and expertly choreographed physical humor. While enjoying a day at the beach with his family, a boy builds a perfect sand castle and a dragon promptly moves in toting a well worn suitcase. The youngster can’t believe his luck while the rest of the family can’t believe him. Mischief blamed on the dragon eventually gets the child in trouble, but that doesn’t stop him from building an even better castle the next day. While the text is fun, the story is truly told through the comical illustrations. The friendly red dragon’s expressions are hilarious whether he is joyfully flying a kite, gobbling sandwiches, or has his snout wrapped in a towel to smother his smoke. Readers will enjoy pointing out what could be real-life explanations for everything the boy attributes to it. Certainly “no beach bully would dare stomp your castle with a dragon inside.” (But it would run from an angry dad, pictured behind the narrator.) From the delighted face of the boy when he finds the dragon, to the frustration of the parents when the creature has caused too much trouble, the story and pictures show a classic family outing. This story of a runaway imagination will make for an entertaining storytime as well as an enjoyable one-on-one read. 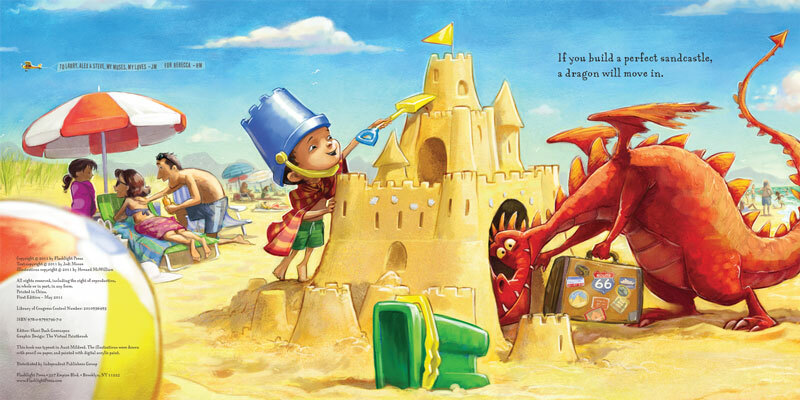 A dragon moves into a boy’s “perfect sandcastle,” but his family doesn’t believe him. The roaring they hear is waves crashing, the dragon’s feather is from a seagull, and its teeth “are just broken shells.” While the concept certainly isn’t original, the digital illustrations do a good job extending the humor of the situation. …Moore uses the engaging second-person point of view, referring to the reader as “you.” It draws you directly into the story and gives it a strong and inviting structure as well. The story moves quickly from one moment to the next, which creates a vibrant feel to the story. It’s a story that speaks to the power of imagination in creating a special time. McWilliam’s art has a cinematic quality to it that children will immediately respond to. He captures emotions on faces with comedic skill. This is a refreshing style to have in a children’s book because it closely mimics what they see in films. It’s a friendly and lovely thing to see. A great beach read, this will have children scrambling to get their castles up and welcoming to dragons. Jodi Moore’s lyrical language and magical story will have you wishing you had your own dragon adventure this summer. The illustrations by Howard McWilliam are enchanting. There’s no place you’d rather be than on the beach with a dragon while reading this story, and Howard McWilliam makes sure you are transported there instantaneously. Every little detail is perfectly placed for a fun-filled day at the beach. My advice… pick up a copy today and take a mini-vacation with your little readers. I guarantee you’ll love it and I’m pretty sure you’ll be tempted to build your own sandcastle, even if it’s just in a sandbox, because you know ‘if you build a perfect sandcastle, a dragon will move in’. “When a Dragon Moves In tells the tale of a little boy and his family at the beach, and the misadventures he gets into when a dragon moves into his perfect sandcastle. It’s funny, too, making both me and my daughter laugh (a good children’s book should always entertain the parent in my opinion). Bright illustrations added to the lively tale. Imagination is the central theme to this book and the boy around which the story revolves certainly has it in spades…. My child loved all the little details about the dragon, and since she has been going to the beach a lot lately, the setting was perfect for her. I’m pretty sure I know what will happen the next time we do go to the beach and she builds a sandcastle! 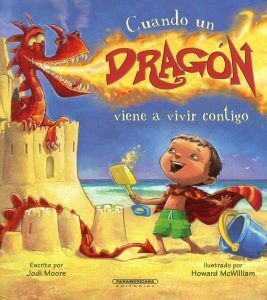 …a colorful fantasy about a little boy having a fun day at the beach … when a friendly dragon moves in to his sand castle. This dragon (is it imaginary? is it real?) is a great friend to the little boy, but also wreaks havoc on his parents and older sister – comically eating all the food, spraying sand everywhere, and more. This book is perfect for little boys who like dragons (which is precisely 77% of little boys). What happens when you build a perfect sand castle? A dragon moves in, of course. 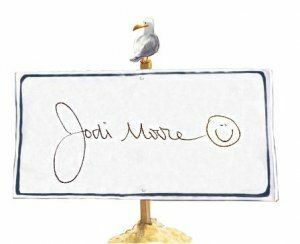 Jodi Moore explores youthful play and the imagination of childhood with the tale of a little boy at the beach. …this book written by Jodi Moore and illustrated by Howard McWilliam will make you want to run to the beach or at least a sandbox! It’s hard to get your family to believe a dragon (a gigantic fire-spitting one) has moved into your sandcastle simply because it’s a perfect sandcastle fit for such a charming beast. Oh, but he’s not so perfect. Was it he who ate the peanut butter sandwiches, blew bubbles in your lemonade, and nibbled the brownies. Something wild is definitely going on at the beach. Is it a dragon or just a wild imagination? Hmmm, you be the judge. …Moore and McWilliam do a terrific job of supplying humor to a boy’s imagination. …Howard McWilliam’s hilariously expressive illustrations are perfect for this light-hearted beach tale. WHEN A DRAGON MOVES IN has arrived and it is clever and delightful! I just love it. It has such a bright and playful spirit. Like you [the author] –I’ve spent many sandy, summery days at the Jersey shore. WHEN A DRAGON MOVES IN has stirred my own sweet memories. The bold, colorful art pairs perfectly with your text. A terrific book! I can’t wait to share it with the grandkids. 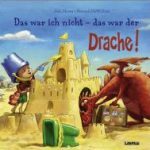 When a boy builds the perfect sandcastle, a dragon moves in, and the two have a great time, until someone begins misbehaving. Is it the dragon? Or does someone have an overactive imagination? Vivid and imaginative illustrations by Howard McWilliam are simply wonderful. …a whimsical summer sizzler about the antics of a dragon who moves into the sandcastle of a lucky little lad. While his family busily goes about their beach business, the boy and his dragon have all sorts of fun roaming around while they roast marshmallows, bust bullies, brave waves, and fly a kite. Despite his insistence of the dragon’s existence, this creative kid cannot convince his family that the dragon is real. And when mischief starts to happen, the boy decides to send his dragon packing “until he learns some manners.” That’s my favorite part because it’s the perfect segue into a character chat with my students. What should a dragon’s manners look like, sound like, feel like at the beach? At home? At school? Who will teach him those manners? How will we know that he’s learned them? Then will he be back? The eye-poppingly expressive illustrations by Howard McWilliam bring the text to life in such a magical way that I actually wanted to believe! After reading this Dragon tale, use the pictures to allow your students to share their favorite sun and sand adventures using as many sparkle words as they can. Then, fire up their imaginations by encouraging them to mesh fantasy with fact as they script a summertime story of their own. 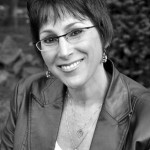 Read an interview with the author on Barbara’s The Corner on Character blog. The Trouble with Dragons: At the beach, everyone is too busy to play, so a boy is left to his own devices. What to do, what to do? Why build a sandcastle, of course. When you build a great sandcastle with a bucket, shovel, and imagination, the real fun begins. Dragons love sandcastles, so, naturally, one will want to move right in. Dragons are perfect friends. They can toast your marshmallows, keep you afloat in the water, and lots of other fun things. But when they eat everything, even Sister’s sandwiches; cover the brownies with dragon prints; and spray Sister with sand, who do you think will be blamed? Grrrrr! There’s only one thing to do: banish the dragon and never build a sandcastle again. At least not today. Every child will relate to this story of a boy who just needs a little attention, but instead is ignored, which is a certain catalyst for trouble. The author hits a perfect tone, showing great imagination, laugh-out-loud humor, and a real understanding of the boy’s problem. Bright, active illustrations nearly jump off the page, supporting this whimsical romp with humorous detail. Kids (and grown-ups too) will love When a Dragon Moves In. When a little boy spends a day at the beach and builds a beautiful sandcastle, a dragon moves in. The dragon toasts marshmallows, holds up the little boy’s kites, scares bullies away. He roars (like the sound of the ocean), has sharp teeth (like broken shells) and eats a little too much of the family’s food. As you read When a Dragon Moves In, you are clearly shown that the dragon is simply a figment of the little boy’s imagination. His father lounges on the beach and chases away the bullies, mother reads her book and hears the sound of the ocean, not a roar. What a beautiful, imaginative, perfect picture book for preschoolers! I love the way the illustrator’s cheerful paintings make it plain that the dragon isn’t real and it’s okay for youngsters to pretend — but careful what you try to slip past the rest of the family. Blaming your misdeeds on an imaginary friend only goes so far! Highly recommended for little ones and new readers. This is a fun and engaging read which cleverly leaves the reader wondering if the dragon is real or is just the boy’s imagination. Wonderfully paced and accompanied by magnificent illustrations, which are a joy to look at, this story is enchanting and guaranteed to bring lots of smiles. Thumbs up! …a great book for either gender!… Each picture in the book really captures the “beachy” feel…. I would use this book in a classroom up to fourth grade… a good read aloud for younger ones. What is better than a perfect day at the beach? A day at the beach with a dragon! How does one get a dragon you might ask? Well, according to When a Dragon Moves In, if you build a perfect sandcastle, a dragon will move in! A wonderful day at the beach ensues as a young boy and his dragon play ball, blow bubbles, dance, and roast marshmallows. Would you believe a dragon can also protect your sand castle from bullies? It’s true! But be careful, you don’t want your dragon to be found. That means you’ll have to hide him…and hiding dragon smoke is never easy! Find out what other fun and trouble can happen When a Dragon Moves In. What could be better than a picture book about a dragon? 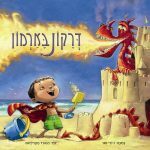 A picture book about a dragon who lives on a beach of course! At least I think so, because I am a fan of dragons, and I love spending time at the beach building sandcastles, exploring tide pools, and dozing under an umbrella. I am therefore delighted to bring you this dragony beachy book. 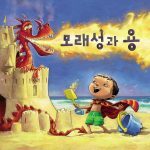 I have a feeling that today’ picture book will inspire dragon lovers to get busy building sandcastles as fast as they can…. Dragon fans are going to love this clever picture book, especially when they see what happens in the end. In fact, they will love the dragon in the story so much that they might be tempted to find a sandcastle dragon of their own. With amusing illustrations and a great story, this is a wonderful picture book to share with someone who is has a soft spot for dragons. 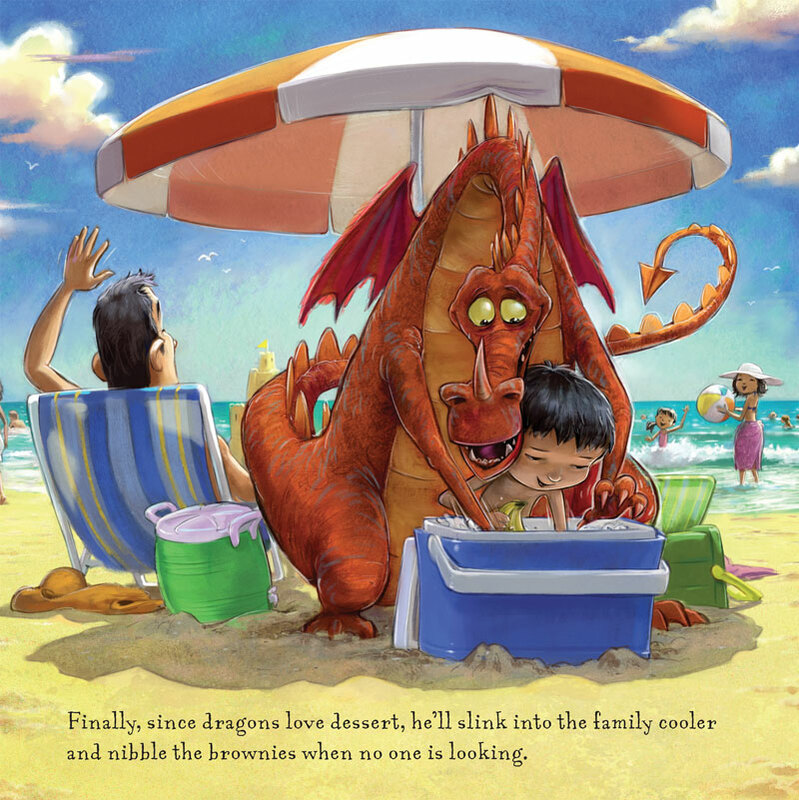 When a Dragon Moves In is a story about friendship, the beach, and a creative imagination…. This 32-page picture book is a cute story about how sometimes our imaginations can run away with us. Though the words and story are simple and charming, the artwork really makes this book stand out. Howard McWilliam does a phenomenal job depicting each detail, lending humor and expression to characters children will want to look at again and again. The artwork really enhances the story, making it a book that children will want to read again and again. With the story of When a Dragon Moves In by Jodi Moore, illustrated by Howard McWilliam, we have a story that reminds one of those instances where children adopt make-believe friends as companions – except in this case such a friend is a dragon. There is very little text on each page, but there is much in the large illustrations for children to think and ask questions about. The story has another twist—the characters do not have names other than mother, father and sister. It doesn’t even say boy, but the reader knows the central character is a boy. In fact, the author suggests that it is the reader who is the center of the story in the first line, “If you build a sand castle, a dragon will move in.” The author and illustrator have captured the essence of a child dreaming up a make believe friend. The story has the ring of a child telling the story even though it was written by an adult who has not completely lost the magic of imagining what it would be like to have a dragon for a friend—even if for one day. This was a delightful read. When a Dragon Moves In is a treasure. Over-the-top fun in eyecatching colors, realistic family togetherness, and a celebration of the power of imagination. Definitely one to add to the summer reading list. A young boy builds a sand castle on the beach and a dragon moves in. 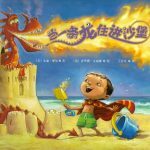 The boy and the dragon spend the day at the shore flying a kite, braving the waves, defying bullies, and roasting marshmallows, while the boy’s parents remain occupied nearby with their own pastimes. When no one believes the boy’s story about the dragon, the creature launches into a mischievous mode and wreaks havoc on everything in its path– or is it all in the boy’s imagination? A day at the beach – specifically the beach at Whipple Dam State Park – inspired Boalsburg mom Jodi Moore to write her first published picturebook, “When A Dragon Moves In,” illustrated in brilliant summertime hues by Howard McWilliam. The story, told in second-person, is about a little boy who learns that if you build the perfect sandcastle, a fire-breathing dragon – carrying a well-traveled suitcase — will take up residence. Like a rambunctious child, the dragon might eat more than his share of the sandwiches, blow bubbles in the lemonade, and kick sand on big sister. But overall it’s a real godsend for the parents, who are mostly left in peace while dragon and hero entertain one another. “When A Dragon Moves In” follows the arc of a perfect family beach day, including rafting, kite-flying, catch, and a picnic. Realistically, after all that sun and frolic, the day ends with our hero’s emotional meltdown and the banishment of the dragon. But not to worry. There’s always tomorrow! The humor and energy of Moore’s text is amplified by McWilliam’s cartoonish illustrations. For example, our hero credits his dragon with scaring off beach bullies, not realizing that Dad, one eyebrow raised, is behind him brandishing barbecue tongs. While the story seems to invite readers to decide for themselves if the dragon is real, the illustrations make it pretty clear that he’s not, at least not in the traditional sense. In fact the red reptile is a simultaneous avatar both of joyous imagination and pesky, impish id. I, for one, can’t decide if the co-star’s dual nature makes the story deeper and more complex, or a little confusing. Likewise, consider the opening line, “If you build a perfect sandcastle, a dragon will move in,” which is compelling in part because it rings a bell. Anybody wanna give a mouse a cookie? Nitpicks aside, “When A Dragon Moves In” is a terrific book to rev up enthusiasm in advance of a beach vacation, or even a day at the beach. And once having read it, young readers will forever after peek hopefully inside their own sandcastles, just in case a dragon has moved in. A little boy arrives at the beach for a fun day with his family. He brings everything he needs for building sandcastles (including an active imagination.) The castle he builds comes equipped with a mischievous and playful dragon. Is it the dragon that eats sister’s peanut butter sandwich and puts dragon prints in the brownies? Did dragon really loose teeth and feathers on the beach? Is that him roaring? The cartoon style illustrations tell the truth about dragon’s existence. This is a great story about friendship, imagination, and families. The text is wonderful and the art is gorgeous, plus it’s the perfect antidote to snowy winter weather! …a great book for either gender!…. Each picture in the book really captures the “beachy” feel…. I would use this book in a classroom up to fourth grade…. a good read aloud for younger ones. A little boy with a big imagination builds a sandcastle at the beach, and guess who moves in? A dragon, that’s who. This dragon adds to the fun and the mischief of the day. When the dragon gets the little boy in enough trouble, its time to kick him out and knock down the sandcastle, at least for that day. This is a really cute book that allows readers to question imagination vs. reality. It sort of reminds me of Me and My Dragon by David Biedrzycki. The illustrations are stellar and I think the cover appeal alone will see this book highly circulated. My name is Madison and I am 7 years old. I have just read When a dragon moves in book. It’s about a boy and his family that go to the beach for a day out. The boy builds a perfect sandcastle its so good that a dragon moves in. The boy and his dragon have loads of fun on the beach and then the boy tries to tell his family about the dragon but they don’t believe him, but then the dragon got into all sorts of mischief like spraying sand over the boys sister and eating her peanut butter sandwiches. In the end the boy kicks the dragon out of the castle and tells him to learn some manners, and says ‘he will never build a perfect sandcastle again’ but he did the next day. I would like a dragon to live in my sandcastle because it would be fun, but I wouldn’t want him to eat my sandwiches. My little brother even enjoyed this book and kept going ‘RAAR’ every time he saw the dragon. 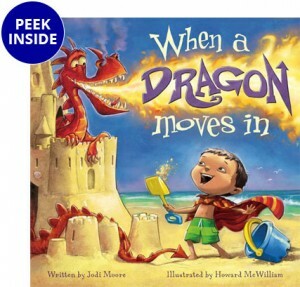 Jodi Moore is the author of When a Dragon Moves In and When a Dragon Moves In Again, illustrated by Howard McWilliam. Jodi has written articles for various magazines and newsletters, and is co-developer of an educational series for the hospitality industry. Writing for children has always been Jodi’s passion because she strongly believes that if you nurture children’s imagination, you will nourish their dreams. Proud of her “Jersey girl” heritage, Jodi attributes some of her best childhood memories to time spent “down the shore.” She lives in Boalsburg, PA, with her husband and two sons who are relentless in their quest to build the perfect sandcastle. 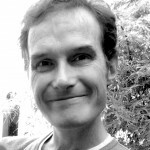 Howard McWilliam is the illustrator of When a Dragon Moves In and When a Dragon Moves In Again written by Jodi Moore as well as I Need My Monster and Hey! That’s MY Monster, written by Amanda Noll. In 2005, Howard left his work as a magazine editor and journalist to concentrate on his growing career as a cartoonist and illustrator. He is published in a wide range of UK magazines and newspapers, and is the cover artist for The Week. He has won numerous awards and competitions for his work. He lives in Cheltenham, England with his wife Rebecca and his two sons. Read more about Howard on his personal website. Error: Error validating access token: Session has expired on Sunday, 23-Sep-18 01:36:16 PDT. The current time is Friday, 26-Apr-19 01:27:46 PDT.